Event held on 17th March to celebrate the collaboration between the UPGro team, the schools, local government and private sector partners. The UPGro Gro for GooD project has been delivering a programme of engagement to teach young people in Kwale County about water science and management. Water Clubs at 3 secondary schools have been participating in field trips, practical activities, experiments and conducting their own group research projects. This outreach work aims to develop students’ research and communication skills and showcase career options in the water sector. In the run up to World Water Day 2018, the Gro for GooD project was delighted to welcome Madam Bridget Wambua, Director of Education for Kwale County, Kenya, to provide opening remarks (extract above) at a special event to celebrate the success of the Schools Water Clubs supported by the project over the last year. As the event got going, students listened with great interest to the keynote speech by Prof. Dan Olago from the University of Nairobi, and then took to the stage themselves for a series of presentations about club activities including water quality testing of school waterpoints, the installation and use of rain-gauges on school grounds, and field trips to the Base Titanium mine to see how the mine manages and recycles water in its operation. Other students presented their own mini-research projects into topics such as water conservation in agriculture and strategies for keeping water safe to drink, and one group gave an excellent explanation of artesian wells based on an email exchange with Gro for GooD hydrogeologist Mike Lane. Students also brought practical demonstrations and posters to show in the teabreak, including a solar still demonstration from a group of students who had just heard that they are through the local round and have been invited to show their improved solar still design at Kenya’s National Science Fair for schools. Madame Wambua and Professor Dan Olago then presented the schools, water clubs and club patrons with certificates of appreciation for their hard work and dedication to water-related environmental education, and 2 laptops were given to each club. The laptops were provided by the UK charity IT Schools Africa and preloaded with water-related environmental education resources collated by the Gro for GooD team. The resource has been published under a Creative Commons licence so that other educational programmes in Kenya can make use of the content. “It has been a privilege to work with secondary school students in Kwale County and help to meet their really encouraging thirst for knowledge about water. Education has a vital role in achieving the Sustainable Development Goal for water and we are sure that many of these students will put their learning to good use at school and as they go on to jobs and further education. Groundwater is essential for economic growth and can contribute to human development if resources are used sustainably to benefit the poorest in society. The Gro for GooD (Groundwater Risk Management for Growth and Development) project is striving to help government and groundwater users find a management approach that balances human health, economic growth, and resource sustainability demands and benefits everyone. Project partners are University of Oxford, University of Nairobi, Jomo Kenyatta University of Agriculture and Technology, Universitat Politècnica de Catalunya, Rural Focus Ltd., Kwale County Government, the Government of Kenya’s Water Resources Authority, Base Titanium and KISCOL. 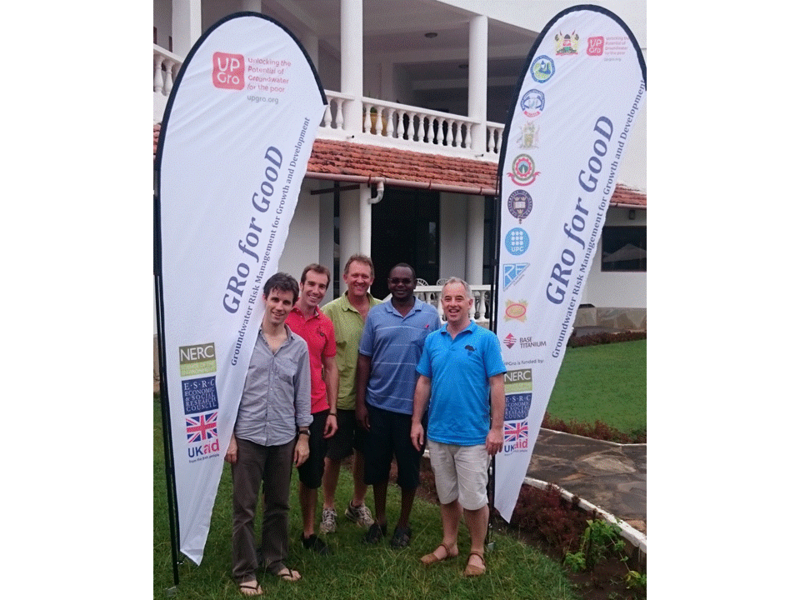 More information about Gro for GooD, which is funded by UK research councils and the Department for International Development, can be found here. Monitoring people’s welfare: where are the poor? Gro for GooD collected data from over 3,000 households each year in 2014, 2015 and 2016 with the support of over 20 local staff trained by Oxford University. These data provide insights into who is poor, where people suffering poverty live and what is changing people’s welfare over time. The sampling strategy spans across Matuga, Msambweni and Lunga Lunga constituencies. The latest round of the household survey took place in September to November 2016. The survey captures information on demographic and socio-economic, health, water sources, waterpoint management, water payments, water resources management as well as governance issues. In addition to the face-to-face interviews Gro-for-GooD has successfully piloted a mobile-based socio-economic survey instrument that can be used for rapid updating of the social component of the Groundwater Risk Management Tool. Kwale County Government is responding to the need to improve the lives of 7 out of 10 Kwale County residents who live below the poverty line of USD1.25 a day. To achieve this, the County needs to know who the poor are, where they are and the likely impacts of different poverty interventions. In an effort to answer some of these questions, data from the three household surveys were used to evaluate and map welfare between 2014 and 2015. Households experiencing declining welfare in this period were observed to be in regions largely influenced by the tourism (Ukunda/Diani) and fishing (coastal strip) industries. However, some pockets within the coastal strip (Kinondo and Vingujini) were observed to have a positive change in welfare. Households that experienced a large positive change in welfare were observed to be around Lukore, Shimba hills, Mivumoni, Mbegani, Majimboni, Mangawani, Mzizima, Kinondo and Mwaluvanga, among others. The majority of households in Lunga Lunga experienced a decline in welfare. The Water Resource Management Authority (WRMA) is a State Corporation under the Ministry of Water and Irrigation. WRMA was established in the year 2003 pursuant to the enactment of Water Act number eight of 2002. WRMA is the lead agency in the regulation and management of water resources nationally. One of WRMA’s core functions is to ensure that there is fair, transparent and participatory allocation and apportionment of water resources to all users, so that everyone who needs water can access it now and for generations to come. Communities are directly affected by the state of water resources. Livelihoods depend not only on water availability but also on the quality of available water, which may be affected by organic pollution from sewage, animal and human waste as well as inorganic pollution from transport, agriculture or industry. The quality of groundwater resources may also be affected by seawater intrusion. Kwale’s groundwater resources have attracted several major abstractors in recent years. Recognising the importance of balancing competing demands for domestic, agricultural and industrial uses of groundwater, the Water Resources Management Authority (WRMA) has been collaborating closely with the Gro for GooD project since its inception. We have been involved directly in a number of activities, including provision of the ABEM SAS1000 Terrameter and participation in the geophysical survey and installation of water level recorders and other monitoring equipment. Data generated from these activities will provide critical inputs to the hydrogeological flow model for Kwale County that is under development by the project and will form the basis of the Groundwater Risk Management Tool. The tool, once developed, will prove most useful in decision-making by WRMA as we allocate the groundwater resources in Kwale County. WRMA is ISO 9001: 2008 Certified. “Groundwater is increasingly important for Kwale’s growth and development. It is a widely available water resource of high quality and low cost. Rural communities know this well and have relied on groundwater for generations managing the resource sustainably. With increasing variability in rainfall which supplies small and large dams, groundwater provides an important alternative for new water demands from irrigated agriculture, mining or tourism. “Managing groundwater sustainably so the resource is not over-used or contaminated is challenging. Science can provide support to help make better informed decisions. Oxford University is proud to work with the County Government, Water Resources Management Authority, Base Titanium Ltd., KISCOL, Rural Focus Ltd. and local communities to develop a better understanding of groundwater risks to help protect the resource for everyone. “The Gro for GooD project – Groundwater Risk Management for Growth and Development – competed in an international research competition and was ranked in first place for the innovative and inclusive nature of the project. Working with the University of Nairobi, JKUAT and Rural Focus Ltd. in Kenya and the Polytechnic University of Barcelona in Spain (UPC), the team boasts some of Kenya’s and the world’s best scientists working on groundwater systems from hydrological, geophysical, geochemical, social and economic disciplines.